Review: This film is based on a true story and is set during the Cold War. 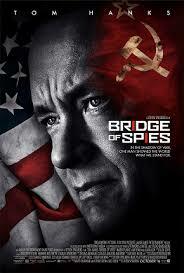 Tells the story of James Donovan who is a U.S. lawyer and is recruited to defend an arrested Soviet Spy in court. He then has to help the CIA facilitate an exchange of the spy for the soviet captured American U-2 spy plane pilot named Francis Gary Powers. As soon as this film starts you know that you are in for a good film and that it won’t disappoint. I was particularly impressed with the script and thought that it was quite witty but in a dry sense. The Coen Brothers (Joel and Ethan) wrote the screenplay. With such a brilliant script they made the characters come to life. The music was also very good with the score from Thomas Newman. There were times where it reminded me of the film Lincoln. Tom Hanks and Steven Spielberg have worked together 3 times before. Fantastic performances from all of the cast including Mark Rylance who is up for a Golden Globe Nomination. This is a very elegant and intelligent film but then you did come out feeling quite tense. It was also very enjoyable in its weird way. After the film all I wanted to do before heading home was to go to the corner shop of Regent Street and get some Marmalade!!. At the Bafta Awards in 2016 Mark Rylance won for Best Supporting Actor. At the Academy Awards in 2016 this won one Oscar and that again went to Mark Rylance for Actor in a Supporting Role.